Welcome to Thaos mod! Here’s a few words about the contents, and an installation guide. The mod has two paths: friendship and romance. At the moment, the mod is available in English only; the romance path is only available to ladies*. Friendship path is open for all Watchers. 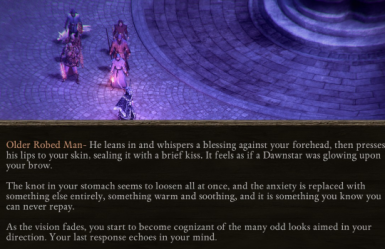 Also the romance path is very specific - even more so than the Watcher's memories as such - so please bear in mind that the only real choice you will have is how to end that story. There is an implied love scene along the way, but it's very sfw. You might want to be on the lookout for some Engwithan artifacts in Defiance Bay, as those add some new content, too. 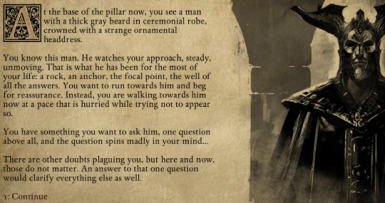 There is one resolve check in a dialogue – it doesn’t do anything, it’s just flavor text – but if you want that extra bit, make sure your resolve is 18 or higher. First, do a backup of your game files! The mod is working, but any mod can mess up with your game files, so let’s be on the safe side. Simply copy them into a different folder - somewhere outside of the game folder. You need to copy "conversations" folder and "localized" folder - or just "en" from the latter. 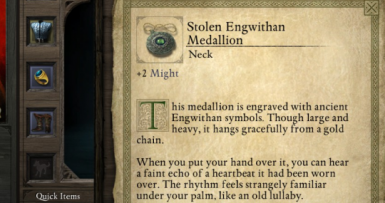 This was tested on a PoE version including both parts of the White March and the free Deadfire Pack. 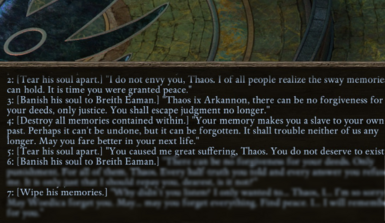 Which shouldn't matter for this mod, but mentioning it just in case. Also, for now, the mod only works with the English version of the game. One warning: this could potentially mess up the final game save. 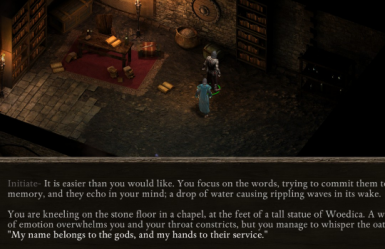 So you might not want to import the save from the modded game into Deadfire; better set the story manually. Also, once installed, the mod will apply to conversations even in the saved games, so if you don’t want that, just avoid loading other saves while playing the mod. That’s all; the mod is now installed. It starts at Cilant Lîs, so you should be able to tell whether it’s working pretty fast. To uninstall, simply overwrite the modded files with the original ones from your backup copy.